Summary– Quantrell visits Quickfire in prison and has her undergo secondary terrigenisis. Back at HQ he meets with inverted Luke Cage. Elsewhere in New York the Fast Five try to escape after robbing a bank. Spectrum, Power Man, Ava Ayala, Kaluu, Blue Marvel and She Hulk make short work of them. These events are monitored by the inverted Avengers, Tony Stark/Iron Man and Captain America/Samuel Wilson. Back at the Mighty Avengers offices Inverted Luke Cage tells the team he has sold the Mighty Avengers brand to Quantrell, head of Cortex Incorporated. Having revealed his true colors She Hulk meanwhile reveals she has legal contingencies to stop such a sale. Inverted Luke leaves and runs into the Inverted Avengers. Art– The latter half of the book was fluid, emotive and highly evocative of Joe Maduiera circa 1996. I like! Team– Seeing the team all operating together was a welcome change from the more individualized tales the last Mighty Avengers series took on. New reader friendly- Every single member of the team got a chance this issue to illustrate their powers and that’s always a good move earlier on in a new series. Contingencies– She hulk’s paper work contingencies came right out of left field and caught both myself and most if not all long time readers of Luke’s Mighty Avengers. It just goes to show that despite all appearances to the contrary Al Ewing’s writing has layers, he not making this up as he goes along. Inversion– We only got a glance at inverted Luke last issue but this one he stands out as not necessarily evil version of himself but a more money focused version of himself who perceives only his family as worth saving in the world. It’s an interesting and dare I say neat twist to the old “evil version of yourself” jig that we typically see. Cover– This cover highlights the All New Captain America which is clearly on the basis or hope that he will boost interest and/or sales of the issue. Despite this the cover is still pretty cool. 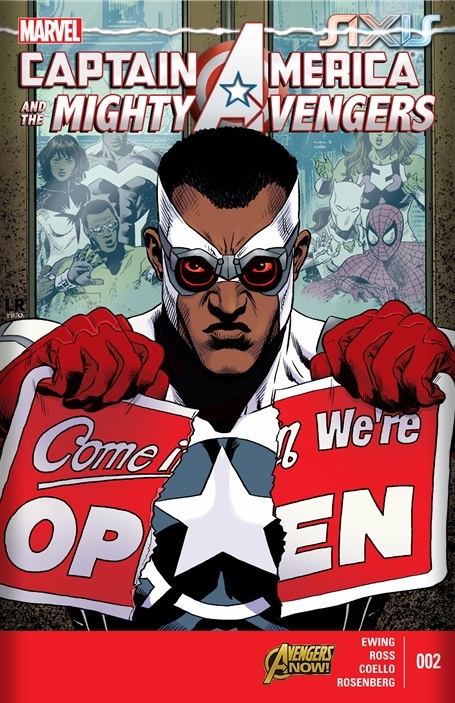 All New Cap is in the foreground while behind the glass directly behind him we have Ava Ayala, Power Man, She Hulk, Monica Rambeau, Spider-man and Blue Marvel looking on as the Mighty Avengers come in were open sign is ripped in two. Art– Having two artists with very different styles on a single book is never a good thing. The first half of the book was dull, damn near lifeless and very stilted. I pray we are never subjected to this drivel again. Tie in– While this issue was new user-friendly in some ways by having it tie into axis. New readers will be lost as all hell in understanding why Captain America and Luke Cage are currently assholes. Not to mention continuity wise this I have no idea where this tale takes place. Is it before or after the all new Captain America series? The ending also has issues. 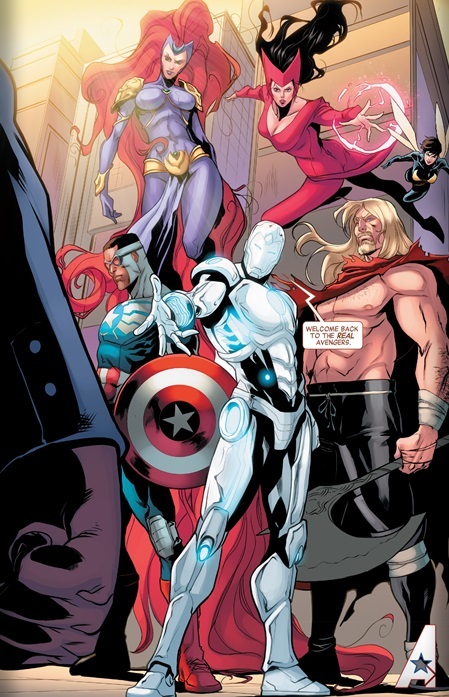 Sure fans will get a kick out of the Mighty Avengers Vs the Inverted Avengers BUT the inverted Avengers plan was to shrink all the heroes as they did in Avengers and X-men Axis #5 why would they battle the Mighty Avengers instead of shrinking them? If this takes place before the shrinking of the Avengers then how on this planet do the inverted heroes convince the normal avengers to meet at Avengers Tower? Emotion- This issue also fell flat in the emotional department. Handled correctly Luke and Jessica’s exchange could have tugged at the hearts strings instead it just fell flat. Im confused. Whats the “inverted” luke cage mean? Luke’s been turned into a villain. It happened in the AVX Axis book. Well not a villain but more opposite of his normal nature, where he is normally selfless and gives to the people, he is now selfish and thinks only about him and his family.